Evolve Nutrition Creatine Mono increases strength and improves muscle performance. Creatine monohydrate is the original lean muscle builder, becoming popular during the 90's and having been well researched ever since. Plays a role in the body's energy cycle therefore improving endurance during your training and increasing strength for greater lifts. Creatine Mono is an addition to the brand’s Kre-Alkalyn product which is a ph buffered form of creatine taken as capsules just before you train. Mono is Evolve's monohydrate version which offers greater value for money at the same premium quality. In addition to more strength during your gym sessions you may also feel an improvement in your recovery time while using this product. Creatine is responsible for your body’s energy production and ‘recycles’ molecules faster to produce more energy. This means energy is produced quicker keep the rest between training sets short. Available in a generous 60 serving container with each unflavoured serving providing 5 grams of creatine monohydrate it can be added to your protein shake, mixed with water or taken with grape juice. Adding it to a sweet fruit juice like Grape improves the effectiveness by increasing the uptake of creatine into your muscle cells. 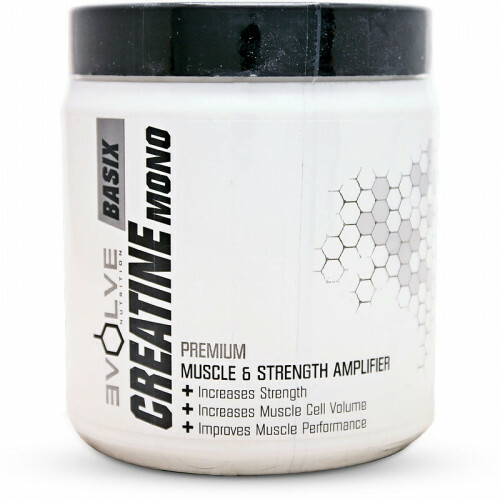 Evolve Nutrition Creatine Mono is tried and tested lean muscle gainer which won't cost you a fortune. Allergen Warning: This product has been produced in a facility that may also process ingredients containing wheat, milk, egg, soybeans, fish, shellfish, tree nuts, and peanuts. Add 1 rounded teaspoon with a glass filled with 200-400 ml of cold water or fruit juice. The mix it up with a spoon. Take 1 rounded teaspoon with morning, afternoon and evening meals and 1 additional serving before going to bed for 4-5 days to help saturate your muscles with Creatine. Take 1 rounded teaspoon with a meal or immediately after training with your post workout protein shake. Drink at least eight glasses of water daily when supplementing with Creatine. This product is only intended for healthy adults, 18 years of age or older. Do not use if pregnant or nursing. Consult with a licensed qualified healthcare professional before taking this or any dietary supplement product. Immediately discontinue use and contact your healthcare professional if you experience any adverse reaction to this product. Use only as directed. Do not use if safety seal is broken or missing. KEEP OUT OF REACH OF CHILDREN.